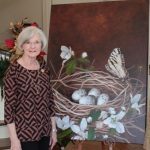 Featuring “The Alabama Nest” which is part of the permanent collection at the Governor’s Mansion in Montgomery. 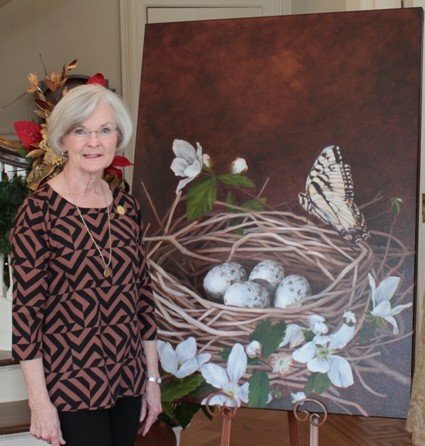 First Lady Dianne Bentley helped create the original work which incorporates state symbols. Yellow hammer eggs (state bird) are nestled in a branch of blackberry blossoms (state fruit) with an eastern tiger swallow tail butterfly (state butterfly) resting on top. Boxed set includes 8 folded note cards and premium white envelopes. Blank inside. Printed and shipped from Birmingham, Alabama. Local delivery may be arranged upon request. Please allow 1-2 weeks for delivery.